MADRID.- 35 paintings will be seen alongside 31 full suits of armour and pieces of armour loaned from the Royal Armoury in Madrid, considered the finest collection in the world along with that of the imperial collection in Vienna. Together, they will narrate the evolution and impact of the court portrait in the period from the 16th to the 18th centuries. 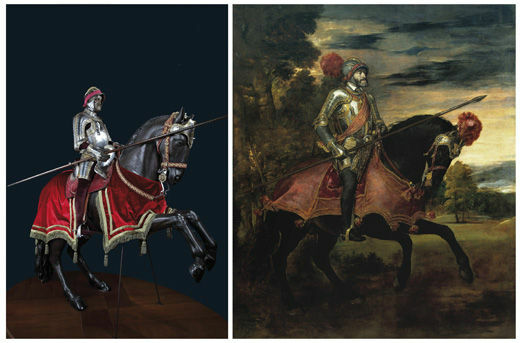 Particularly noteworthy is the juxtaposition of Titian’s portrait of Charles V at Mühlberg and the impressive suit of equestrian armour belonging to the Emperor: a masterpiece of the art made by Desiderius Helmschmid, one of the leading armourers of the 16th century. 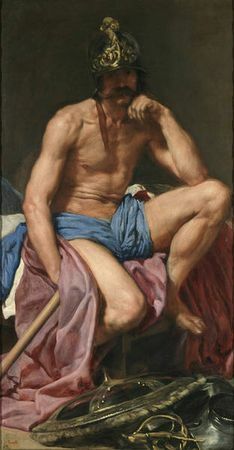 Based on the exhibition held at the National Gallery of Art, Washington, last year, “The Art of Power” to be held at the Prado offers a more complete presentation of the subject. It focuses on the meaning and symbolism of armour and its representation in painting. From the viewpoint of an exhibition, this is an unprecedented subject that has only previously been analysed as a subsidiary issue in a few studies on the history of the portrait. The Royal Armoury in Madrid was founded at the height of the Spanish crown’s international splendour and prestige. Largely created by the Emperor Charles V (1500-1558) and his son Philip II (1556-1598), it houses the personal arms and armour of the Spanish monarchs as well as military trophies and diplomatic and family gifts. These objects became key vehicles in the transmission of an ideology of power, while they also functioned as witnesses to the historical reality of Spain and Europe in the Renaissance and Baroque periods up the end of this chapter in Spanish history, which concludes with the 18th-century Bourbons. 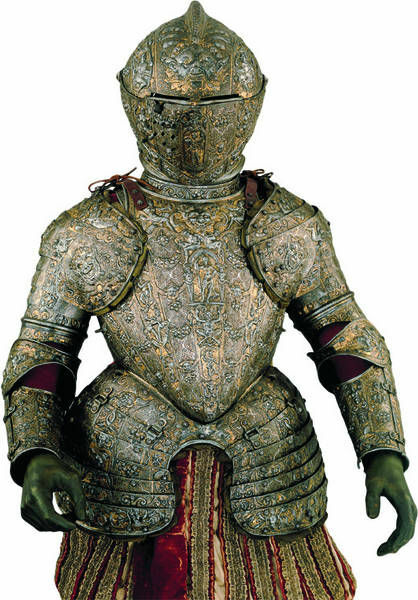 The Armoury’s collection includes items dating from as early as the 13th century. In its entirety, it responds to the wish of Philip II (as expressed in his will) and that of his successors to tie the sovereign’s personal possessions to the Crown so that they were not subject to testamentary divisions. The exhibition takes the form of an introductory section and four monographic ones, entitled “The Court Portrait and the Armouries of Charles and Philip II”, “The Absence of Portraits in Armour in the second half of the 16th century and their Revival under Philip III prior to his Accession”, “The Royal Armoury in 17th-century Court Painting”, and “The Bourbon Armed Portrait: the French and Spanish Tradition”. Overall, the exhibition offers a broad overview of the issues pertainingto the relationship between armour and painting. Along with the 35 paintings and 27 pieces of armour that constitute the core of the exhibition, visitors can also see a tapestry, medals and sculptures that further explain the connections between the two principal groups. The exhibition opens with an introductory room that aims to explain the importance of the royal collections of armour and painting at the Renaissance and Baroque courts as well as ideological and thematic connections. Notable exhibits in this room include the Parade Helm of Charles V with the symbol of the Golden Fleece, an object that emphasises the monarch’s position as Grand Master of that prestigious knightly Order, and the Burgonet of Charles V, symbolising the victory of Christianity over Islam. 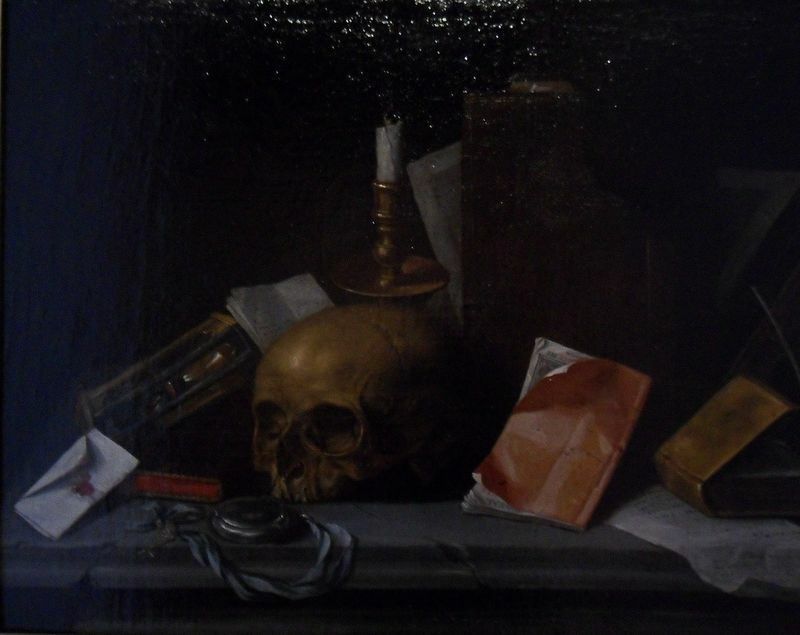 These objects are seen alongside paintings by Velázquez, Rubens and Teniers. Also on display are documents containing orders given to the Royal Armoury allowing Velázquez and Rubens access in order to copy details of arms and armour. 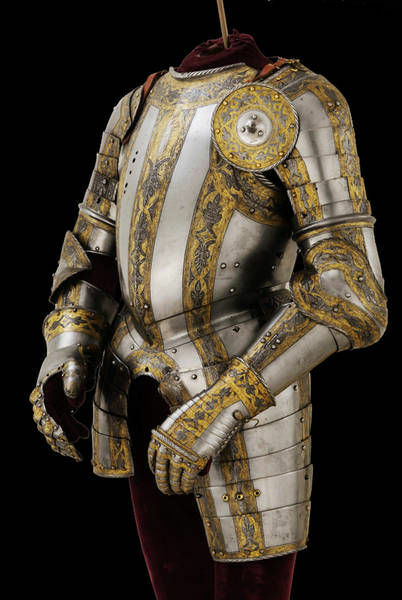 The exhibition opens with an introductory room that aims to explain the importance of royal collections of armour and painting at the Renaissance and Baroque courts as well as ideological and thematic connections. Notable exhibits in this room include the Parade Helm of Charles V with the symbol of the Golden Fleece, an object that emphasises the monarch’s position as Grand Master of that prestigious chivalrous Order, and the Burgonet of Charles V, symbolising the victory of Christianity over Islam. These objects are seen alongside paintings by Velázquez, Rubens and Teniers. Also on display, and indicative of the close link between armour and paintings as symbols of royal power, are documents with the orders given to the Royal Armoury to allow Velázquez and Rubens access in order to copy details of arms and armour. 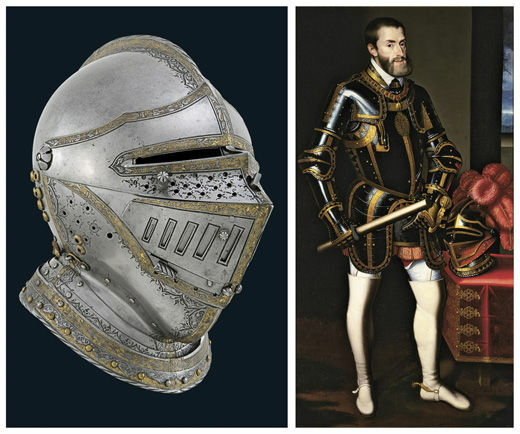 The first section analyses the influence of the armouries of Charles V and Philip II (prior to his accession) on the court portrait. It will introduce the visitor to the rise and splendour of the armed portrait, a genre that was closely associated with the triumphant image of the Spanish monarchs as victors in war and during their majestic and opulent trips to Italy and Germany. 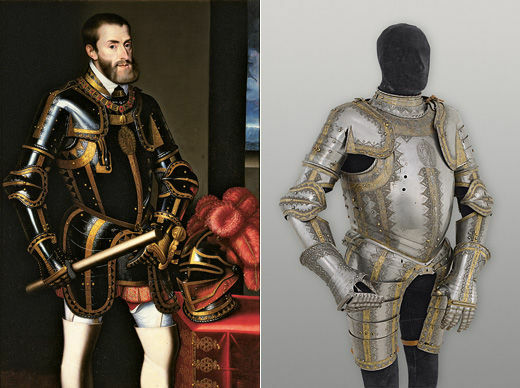 Suits of armour such as the one worn by Charles V at the Battle of Mühlberg (made in 1544 by Desiderius Helmschmid), together with Titian’s impressive portrait of the Emperor, or the Burgundian Cross worn by Philip II at the Battle of Saint Quentin (made by Wolfgang Grosschedel) and its inclusion in Anthonis Mor’s portrait, indicate the symbolic importance of these objects. The second section of the exhibition looks at Philip II’s new use of the armed portrait with respect to its earlier manifestations. The king either favoured the classical image “alla romana” with its heroic connotations, or the use of court dress, except in compositions relating to the Battle of Lepanto. These concepts are illustrated through objects such as the Parade Armour of Philip II, a suit of ceremonial armour that is exhibited next to Leone Leoni’s sculpture, and the Helmet of Ali Baja, a trophy from the Battle of Lepanto, shown alongside Titian’s painting that commemorates that victory. Royal armour was not commissioned for much of Philip II’s reign, but there was a revival of this art form arising from the uncertainty surrounding Philip III’s survival as the last possible heir in the dynastic succession. 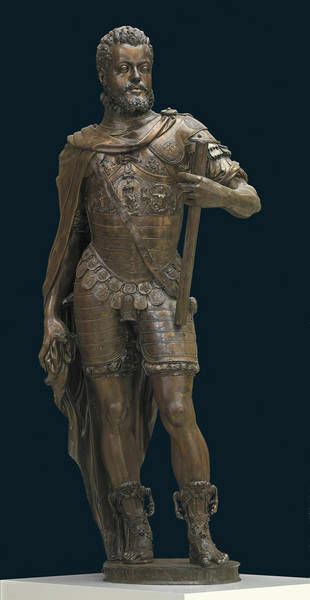 This revival saw the creation of a series of portraits in armour associated with Philip taking the oath as Prince of Asturias, for example, the portraits by Pantoja de la Cruz and Justus Tiel, which are displayed next to child armour made by Lucio Marliani and Pompeo della Cessa. The tradition was continued during the reign of Philip IV in works such as the Portrait of Philip IV with two Servants by Gaspar de Crayer, in which the monarch is depicted in the ceremonial armour sent to him in 1626 by Isabel Clara Eugenia. The third section, entitled “The Royal Armoury in 17th-century Court Painting”, shows the different phases in the relationship between the collection of the Royal Armoury in Madrid and the court portrait, ranging from its close links with the image of royal power to its use as a mere repository of motifs applicable to different types of painting from the second third of the 17th century onwards. During that period armour and the way it had been used by Charles V and Philip II to convey symbolic notions of power continued to be a source of inspiration for a number of court portraits (such as Philip II on Horseback by Rubens, and Charles II in Armour by Carreño de Miranda). At this period, however, we see the holdings of the Armoury being used as accessories in portraits of nobles such as the Count of Benavente by Velázquez, that of the 3rd Marquis of Santa Cruz at the Relief of Genoa by Pereda (a recently restored canvas), and the image of the Count Duke of Olivares seen in The Recapture of Bahía in Brazil by Maíno. The sitters in these compositions appear wearing armour from the “Felicísimo Viaje” and with the ceremonial sword of the Catholic Kings. The final section of the exhibition looks at the ascent to the throne of Philip V, a monarch who combined the French taste for the portrait in armour with the Spanish Habsburg tradition. 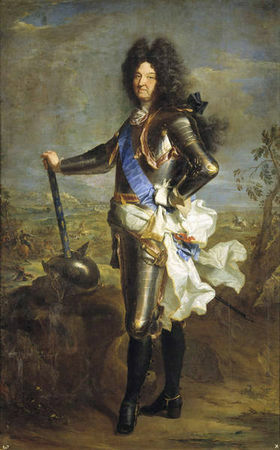 The most telling example of this fusion is the anonymous portrait of the new monarch as a young man wearing Philip II’s armour that had once been depicted by Titian. This section also includes portraits of Ferdinand VI in part-armour by Jean Ranc, and that of Charles III by Mengs, which is the last example of a portrait of a Spanish monarch in armour and the final work in the exhibition.